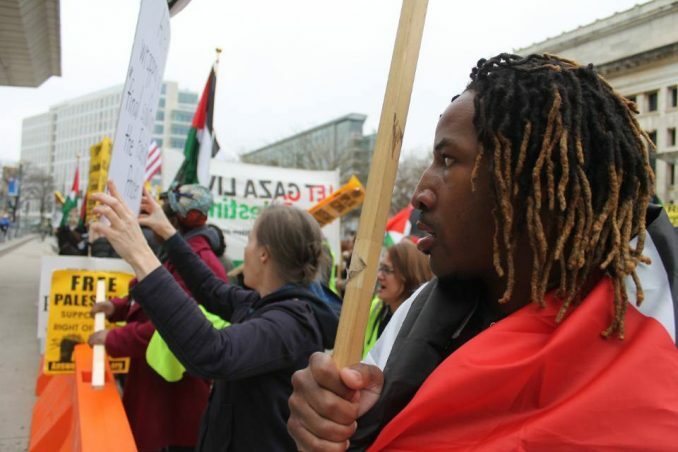 Hundreds of Palestinians and supporters rallied outside the White House before marching to the Walter E. Washington Convention Center on March 26. The demonstration, organized by the Cleveland and Midwest chapters of Al-Awda: The Palestine Right to Return Coalition and the Answer Coalition, protested United States aid to Israel, scheduled to exceed $38 billion over the next decade, and the opening of an annual policy conference by the American Israel Public Affairs Committee. Other rallies by the Jewish campaign IfNotNow and the women’s organization Code Pink had already begun outside the convention center. Before the march from the White House arrived, members of the far-right Jewish Defense League attacked participants in the growing protests. Their assaults with flagpoles hospitalized at least two demonstrators: Ben Doernberg, an IfNotNow member from Boston, and Kamal Nayfeh, a Palestinian-American instructor at North Carolina’s Central Piedmont Community College. “I feel hits from everywhere, and I fell down and I can feel the kicks everywhere on my body,” Nayfeh recounted to Charlotte’s WSOC television station. The attack on Nayfeh resulted in criminal charges against two JDL members: Yosef Steynovitz, a 32-year-old from Thornhill, Ontario, Canada, for assault with significant bodily injury, and Rami Lubranicki, a 59-year-old from Howell, N.J., for assault with a dangerous weapon. Some media say the two also face charges of a “suspected hate crime” due to “anti-Arab” bias, a claim that other reports have disputed. The latter attempted to terrorize Muslims in Islamberg, N.Y., last May by staging a “Ride for National Security” through the rural area. But their plans fizzled when exactly five bikers encountered a mobilization of 400 supporters from the surrounding community. Steynovitz is one of a small but vocal number of JDL militants, centered around Toronto, who frequently deploy across the border for counter protests in the U.S. But with Israel continuing its drive to the right, and Zionism losing whatever appeal it once held for many Jews, as well as much of the U.S. public at large, the JDL’s unapologetic racism and thirst for violence may represent a growing tendency within the world Zionist movement.